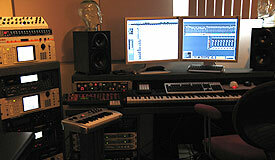 Andrew K Music studio has been designed from the ground up as a film composers haven. Synchronization to picture and a vast arsenal of orchestral and synthesizer sound modules connected to 96 inputs of Panasonic DA7 digital consoles is just the beginning. Andrews incredible template of orchestral and modern sounds in conjunction with top quality reverbs and digital and analog components provide him with the tools necessary to handle virtually any scoring job. 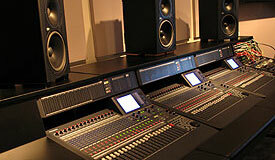 Combine this with a 5.1 surround sound THX® certified speaker system housed in a studio designed and built by John Pappenbrook and you have Andrew K Music studio.